Car buyers today aren’t confining their choices to one particular segment – a compact SUV, premium hatchback and sedan are all within the same consideration list. So, we put them all together to see what each of them has to offer. To say that the compact SUV segment is creating a lot of traction would be a gross understatement. 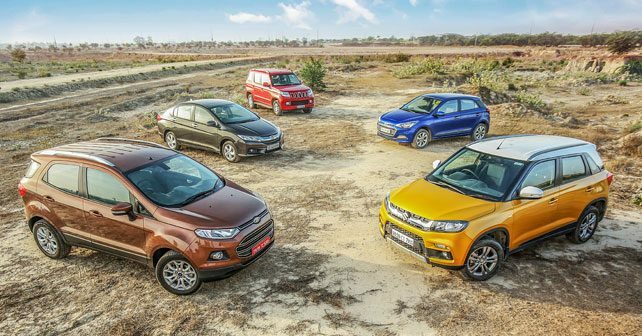 And with the country’s number one car manufacturer, Maruti Suzuki, throwing its hat into the ring with the Vitara Brezza, players like Ford have had to take corrective action and slash prices for the EcoSport. The rough and tumble TUV300 from Mahindra is undeterred though, and continues to chip away at its rivals – in both urban and rural markets. But buyers are becoming increasingly likely to shop across segments and choose between everything from a crossover, a premium hatch and even a sedan. So we’ve roped in segment leaders like the Hyundai Elite i20 and Honda City as well to keep the Vitara Brezza honest. Honestly, though, what this test signifies is that things have never been this good for Indian car buyers – not only are you folks spoilt for choice, but you’re also getting far more bells and whistles than ever before thanks to the intense competition. Purists tend to frown at the crossover segment. Those on one side of the fence say that crossovers don’t have the off-road capabilities that an SUV needs, while those on the other side say that crossovers don’t handle quite as well as a car with a lower center of gravity. Both say that the compact SUV is merely a fashion statement. But buyers say that they enjoy the commanding driving position and the clear view of the road ahead. Plus, with the majority of our roads being mild off-road trails at best, the increased ride height can be quite an advantage. And that’s to say nothing of the increased space in the cabin and luggage compartment. Families love their crossovers because they combine utility with style – and, of course, a macho image doesn’t hurt either. Moreover, a crossover by its very nature is based on a monocoque chassis – and, therefore, should handle almost as well as its car siblings. Take the EcoSport, for instance. Sure, it may look a bit like a hatchback on stilts but it is aggressive and modern. As a result of which it’s been clocking steady sales numbers since it was introduced four years ago. And, on the road, Ford’s DNA shines through. The EcoSport actually handles pretty well, until you start to push it that is – at which point the steering starts feeling vague and unresponsive. At the same time, the body roll kicks in – urging you to back off. The ride quality, though, is pretty good. So you can dismiss those potholes in the road with complete confidence. On the whole, though, it does feel quite confident on the road. The Mahindra, on the other hand, is the king of questionable road surfaces. Whether it’s on bad tarmac, or none at all, nothing seems to upset this body-on-frame compact SUV. As a result of its set up though, it does seem to bounce around a lot more than the two car-based crossovers here. It is more rugged of course, but it does fall short in terms of road manners compared with the other machines in this test. Body roll is more pronounced as well, so you tend not to push it too much through sharp bends. This, then, is more of an old-school SUV if that’s what you’re looking for. The new kid on the block, the Maruti Suzuki Vitara Brezza, meanwhile is the Sultan of Swing – as it’s happiest carving through corners at any speed. It corners completely flat and full of confidence. The Apollo Alnac tyres and direct steering inspire a lot of confidence, and urge you to push this machine to your hearts desire. The trouble with engineering a car to handle well, though, is that you have to give up a certain amount of ride comfort. So, while the driver will likely enjoy the winding ghat roads, the rear seat passengers probably won’t. The new Baleno has the same issue. The handling is brilliant, and the chassis is stiff, but the low speed ride can be a little busy – especially if you’re seated in the rear seat. Ride-and-handling balance is something that the Elite i20 has managed to get absolutely spot-on. In fact, Hyundai has been on a bit of a roll lately – having captured the last three Indian Car of the Year awards, with the Grand i10, Elite i20, and Creta. Historically, the set up favoured by Hyundai has been extra soft, which hurts handling and body control. But they’ve made huge strides over the years, and this is best exemplified by the i20 – which retains its composure no matter what the road surface. On top of that it also feels refined and smooth at all times, making it a very good city car. There’s certainly something to be said for the practicality of a hatchback in a congested city centre. What about the only sedan here, then? Well, love it or hate it, the Honda City commands respect, as it’s been the undisputed ruler of the C-segment since the very inception of this class. The City is all about comfort – and, therefore, the ride is soft and pliant. It glides over broken patches seemingly with a big smiley face. Fundamentally, the chassis is very good and it plays along if you throw it around. But the narrow tyres lack outright grip, and the steering doesn’t provide much feedback. This is certainly the king of the back seat in this company though. The Brezza gets the tried-and-tested 1.3-litre MultiJet unit, which has been a lifeline for Maruti Suzuki. In this trim, it gets 89bhp – like in the Ciaz and S-Cross. In the Baleno, you get 74bhp, like you do in the Swift. As a result of which, you do yearn for more power in the Baleno – but not so in the Brezza, which feels quite adequately powered when you put your foot down. As always, there’s turbo lag under 2,000rpm – but the revs rise quite quickly. In addition to it being punchy, Maruti has always been able to tune this Fiat motor such that it seems refined and very usable – and this is the case with the Brezza as well (check out our BIC Test this month, elsewhere in this issue, to see just how the Brezza did at the track). At present, the five-speed manual transmission is your only option – but the clutch pedal and gear lever are both light and easy to operate. The EcoSport brings 99bhp to the party, courtesy of its 1.5-litre turbo-diesel that does a pretty good job of hiding any turbo lag. Peak torque is spread all the way from 1,750rpm to 3,750rpm, which makes this machine very drivable. Cross 4,000rpm though, and the engine tends to feel a little strained. And, apart from this diesel motor, the EcoSport has a range of engines – there’s a 1.5-litre petrol automatic, and a much more entertaining 123bhp 1.0-litre EcoBoost three-cylinder turbo-petrol. This is the one to have if you put the driving experience above all else. With the EcoBoost, the EcoSport is more of a hot hatch than a crossover. What’s missing with the EcoSport too, though, is a diesel automatic. It’s safe to say that the TUV300 is the dark horse among this SUV trio, because it relies on a 1.5-litre, 3-cylinder diesel heart. And while it may not be that impressive on paper, the proof of the pudding is in the eating after all. And, on the road, this 84bhp power-plant is actually the TUV’s trump card as it’s one of the most responsive and refined 3-cylinder engines that we’ve ever driven. In the low and mid-range, the TUV is actually quite punchy – which makes it quite apt in the stop-and-go traffic of the city. The TUV’s kryptonite, though, is its top-range as the power completely fizzles as the rev needle climbs. The variant we drove was paired with a 5-speed manual transmission, with long throws and a heavier clutch pedal than the others in this test – again, making it feel the most macho and old-school in this company. If you’d rather rest your left leg though, the TUV also comes with an AMT – the only vehicle in this segment to offer this. It’s also equipped with a micro-hybrid stop-start system, and while Eco mode saps all of its power it does return pretty reasonable fuel economy figures. Hyundai have a lot of experience in making common-rail direct injection engines, and the 1.4-litre – which makes 89bhp and 220Nm of torque – is another fire starter thanks to its smooth power delivery. It doesn’t quite have the grunt or character to be classified as a hot hatch, but it certainly has the most creamy driveline of any machine here. The steering could be more feelsome and precise mind you. The driving experience of the i20 is certainly the most relaxing of the lot though. Relaxing is not what you think about typically when you think of a Honda drivetrain. Honda is known for manic petrol engines that love to be rev. This 1.5-litre i-DTEC engine is their first diesel motor, and it’s a good one. The trouble is that they’ve been reluctant to put in enough insulation to keep the NVH (Noise Vibration Harshness) levels in check, as a result of which the engine has been criticized as being loud and intrusive. And, sure, it is a bit loud but it’s also very effective while making the City one of the most fuel efficient cars in the country. The City was part of our long-term fleet for over six months and never returned below 18-18.5km/l. After being slammed for years for being stingy in the features department, Maruti Suzuki has decided to finally bring its A-game as the Brezza comes fully loaded. The 7-inch touchscreen infotainment system, with Apple CarPlay, hogs all the attention in the cabin. Fortunately, Maruti has put a lot importance on safety as well – and so the Brezza comes standard with dual airbags, as well as ABS and EBD, which come optional even on the base variant. It has supportive front seats, while the rear provides the best knee room among the SUVs – but the small seat squab lacks under thigh support. The EcoSport’s cabin is starting to feel old, with a sea of buttons on the centre console. Plus, the lack of a touch-screen is telling too. The small, low resolution monochrome display just doesn’t cut it. The Sync infotainment system, though, has loads of features and its voice command option is fairly accurate. The EcoSport seats provide a commanding driving position and have excellent side support. The top of the line variant comes completely loaded with six airbags, but, on the flip side, the base and mid variants don’t get the option to add safety features like the Brezza does. Compared to the Brezza and EcoSport, the TUV feels pretty basic with a digital 2-DIN infotainment system. It does come with voice command and also sends voice alerts if you’re running with low fuel or if you forget to fasten your seatbelt, but it still feels basic. The predominantly beige cabin, though, does make it feel the most spacious – well, partly because it is the most spacious, especially when it comes to shoulder space at the rear. This is also the only machine here that provides seven seats, which is a good plus. The interior of the Hyundai, meanwhile, appears to be in a different league compared with any other machine here. The i20 truly upped the game in terms of the layout and quality of its cabin. The clean layout, with all the features you can think of, makes it a powerhouse from the inside. It also has the longest wheelbase in its segment, which translates into comfortable knee room for rear seat passengers. It also comes with rear AC vents. Following the launch of the Baleno, Hyundai have replaced their infotainment with a smart touch-screen with navigation. And what’s even more impressive is that it comes standard with twin airbags from base variant onwards – though ABS is available on the Sportz trim and above. The City has the longest wheelbase in this five-car shoot out, and this ensures plenty of knee room for everyone in the cabin. The centre console comes with a 6.2-inch display screen and a smart climate control touch screen – which is a first in this class. It also comes with rear AC vents. As mentioned before, though, the cabin could do with better noise insulation. When it comes to seating comfort however, the City is the best by far – both for front and rear seat passengers. The City comes standard with dual airbags, and ABS with EBD. Ford reduced the prices of the EcoSport just a few days after the Vitara Brezza was launched – such is the severity of competition in this segment. And while both cars are quite evenly matched, you would have to give the nod to the Vitara simply because it looks and feels more contemporary. Speaking of looks, the TUV300 will never win a beauty pageant. But then it’s built for those of you who don’t care about looking chic, but those who want a tough and rugged SUV. In terms of cabin space, it’s the best among these SUVs – but it lags behind when it comes to features. For those of you who want comfort, look no further than the City – it has the nicest rear seat of the lot. But if you want a refined, good looking, well made city runabout, the Elite i20 will put a smile on your face every single day. But if you have some road trips planned, and prefer the versatility of a crossover, the Vitara Brezza makes a very compelling case for itself. And that’s the strength of these crossovers – not only do they have added road presence, but they do actually provide added utility as well. X-Factor: Not only is this Maruti-Suzuki crossover well priced, but it looks good and it’s great fun from behind the wheel too. X-Factor: The EcoSport still looks contemporary, at least from the outside. With the 1.0-litre EcoBoost engine, it’s more hot hatch than crossover. X-Factor: If it’s rough and tumble that you’re after, the TUV’s got you covered. Interior space and comfort is pretty good too. X-Factor: The Hyundai Elite i20 is one of the most refined, comfortable and cutting edge city runabouts that you can buy today. X-Factor: There’s a reason why the Honda City has been going strong for over a decade. It’s an institution in India – enough said!